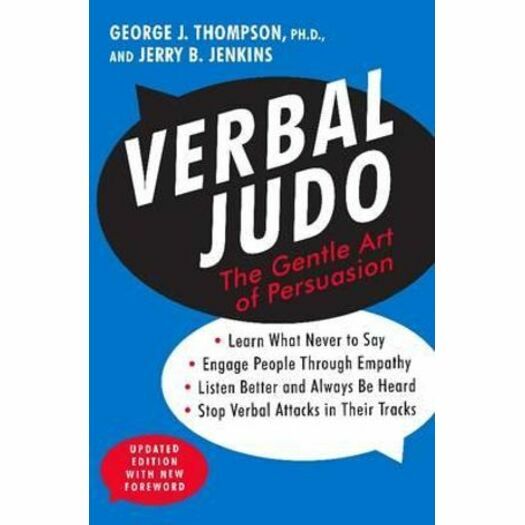 Verbal Judo is the classic guide to the martial art of the mind and mouth that can help you defuse confrontations and generate cooperation, whether you're talking to a boss, a spouse, or even a teenager. For more than a generation, Dr. George J. Thompson's essential handbook has taught people how to communicate more confidently and persuasively in any situation. Verbal Judo shows you how to listen and speak more effectively, engage others through empathy (the most powerful word in the English language), avoid the most common conversational disasters, and use proven strategies to successfully express your point of view-and take the lead in most disputes. Stop being frustrated and misunderstood. Stop finding yourself on the losing end of an argument. With Verbal Judo you'll be able to have your say-and say what you mean.